And UPDATE (2) in December 2017, Twitter introduced a new Tweetstorm/thread feature. Find out more here in this article via Social Media Today. I first wrote this post in January 2015, amending it a year later. 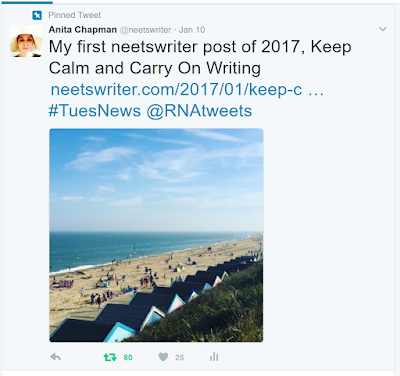 Now, in January 2017, I’m re-writing the post to incorporate changes to Twitter, and to add answers to questions made by clients and course attendees. Since Twitter updates in 2016, images no longer take up any of the 140 character limit, and a user has the ability to retweet themselves. Both of these changes are beneficial. For authors, the option to include book covers, blog tour graphics etc without impacting the character limit is helpful. The option to retweet your own tweets is worth making the most of too (and you can also Quote Tweet yourself, although this isn’t done much). 1) @usernames no longer count towards the 140 character limit. "If your Tweets are not protected, then all replies are public, but only relevant people, such as those who follow you and someone who is part of the conversation will see your reply in their Home timeline, even if you begin your reply with ".@". If you would like all of your followers to see your reply, the best way to do so is by Retweeting or Quote Tweeting your reply." Added 19 April 2017: I've noticed with changes to the way replies work, that when replying to a group tweet, users don't always realise they're replying to everyone. It's easy to remove @usernames from your reply, as per the screenshot below, by removing the tick for who you don't wish to include. Be careful not to copy users into tweets they wouldn't want to be copied into. 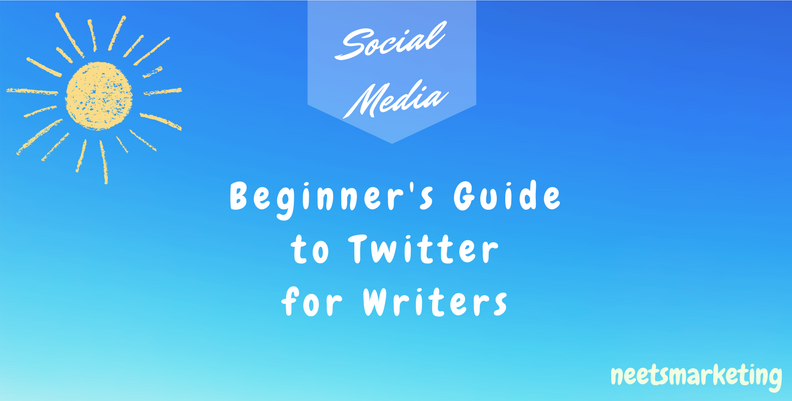 In this beginner’s guide to Twitter for writers, @username means the handle (eg I’m @neetsmarketing) of who I'm talking about in an example and RT means retweet. Please note, I’ve written this guide from a UK user’s perspective, which tends to have a hint of the personal touch. Other markets may be more open about self-promotion than the UK one. The assumption in this post is that you already have a Twitter account set up. To set up a Twitter account click here, and to set up Tweetdeck, which allows you to use columns for lists and searches, click here. You may prefer Hootsuite, but I find Tweetdeck works better for me. Sometimes your name will be taken already, but you can add author to your name or: writer/writes, books, UK, or by including an initial etc. Underscores can be used, but I’d use them as a last resort, mainly because they're more difficult to remember (and you want your network to get to know your @username). And if @egusername is taken and you use @eguser_name, someone may use @egusername by mistake when mentioning you, meaning tweets meant to be seen by you appear in someone else’s notifications. I also find that unless someone is already well-known, usernames with underscores don’t always come up in Twitter searches. When setting up a Twitter account, add a profile photo that looks like you, if possible (!). Ideally, use a profile photo which makes you recognisable when meeting someone in real life, at a writer’s event or book launch etc, as then you’ll find someone you know online is more likely to approach you. Sometimes authors change their profile photo to their latest book cover (if the book is about to be, has just been released), which can be worthwhile. Use the same profile photo on Facebook, Google+, Pinterest, Instagram etc too, if you can-this way everyone will always know it’s you and follows/friending will probably be automatic whenever they see you. A header photo should fit in with your brand, and could be a Twitter banner created by you or a graphic designer to include one or more of your book covers. 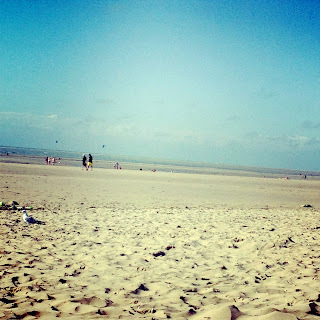 Or it could be a photo of a location in your latest/upcoming novel. Put enough in your bio to make someone want to follow you as they’ll make their decision in a split second. 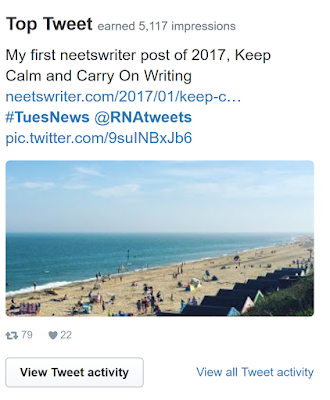 If you’re a member of an organisation like the Romantic Novelists’ Association (RNA) include this and other RNA members are likely to follow you back. 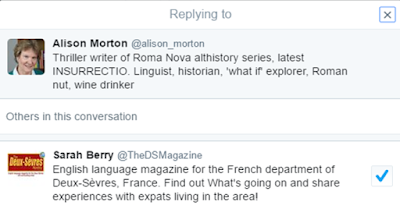 Include as much about your brand as possible: if your books are set in Italy, include this and Italy fans are likely to follow back. If you write 18thc novels, include this so those writers and historians follow you back. This is useful for gaining new followers as they’ll see this when viewing your profile, along with your bio; plus it saves time for those in your network who wish to reciprocate when you’ve retweeted one of their tweets. Follow writers, readers, agents, publishers and people who know about/are interested in what your book is about eg: country houses, cooking, Italy, gardening, art. To search for accounts with words mentioned in the bio (or similar accounts), eg librarian, book blogger, reader; key words relating to your brand: use the search bar and click on People. Aim to follow others like you, and look at who your peers and idols are following. Some writers say that having other writers as followers isn't going to help them, but writers can be incredibly supportive of each other. They're more likely to read your blog and share your posts; and writers read. They might buy your book, and write a review or tell friends (who are likely to be avid readers) about it or book clubs. Plus if a writer in your genre is raving about your book to their followers, they are introducing you to their readers. If you're nearing the 5000 Following mark, it’s not worth using up a follow on someone with 25,000 followers if they’re only following 200 people (ie: they won’t follow you back). If their tweets are essential to you, you can add them to a Twitter list. You don’t have to follow someone to add them to a list, and you don’t have to follow everyone back. See more on lists below. Check and control the number of people you follow by using a website like Crowdfire. I don’t use Crowdfire for anything else, and wouldn’t advise tweeting updates via Crowdfire such as ‘120 people unfollowed me this week’. Reply in some way (unless they’re spammers, or tweeting dodgy photos: see point below on how to block/report spam). Clicking on Like is an acknowledgement and is the equivalent of clicking the Like Button (or reacting) on Facebook, but it's better to reply saying something, if you have time (I also use Like to monitor what I've actioned in my notifications). If someone RTs your blog post or a tweet you constructed, try to say thanks-you can save up and mention lots of people together. It’s OK if you miss the odd one, but it can look unappreciative if you never acknowledge a retweet (and it's unlikely they'll do it again). Sometimes though if your tweet receives a phenomenal number of retweets as part of a popular hashtag, a general thank you which includes the hashtag works. If someone mentions you in a tweet without including your username, you won’t see the tweet unless you search for it. Search for your name in Twitter often to find these tweets, or add a column in Tweetdeck/Hootsuite to catch them. Use hashtags to reach beyond your followers. If you compose a tweet without a hashtag, only your followers (or those subscribed to a list with you included) will see it, or someone searching through your tweets (if they’re not protected-I wouldn’t advise protecting your tweets if you’re an author and want to build your profile). Using a hashtag means your tweet is more likely to be seen by others following the hashtag eg #amwriting #amreading #histfic #romance #chicklit #crimefiction. I’d only use two at the most, three at the absolute max. Using the wrong hashtag can make you look as though you don’t know what you’re doing, so research one before using it. Use hashtags for popular TV or radio programmes etc which you enjoy, or which are part of your brand eg. #thearchers #invisiblecities. Use hashtags for #coverreveal #preorder #kindledeal etc too. There are so many out there, with some being more effective than others (look at what your peers and idols are using), it’s worth investigating what would be useful to you. 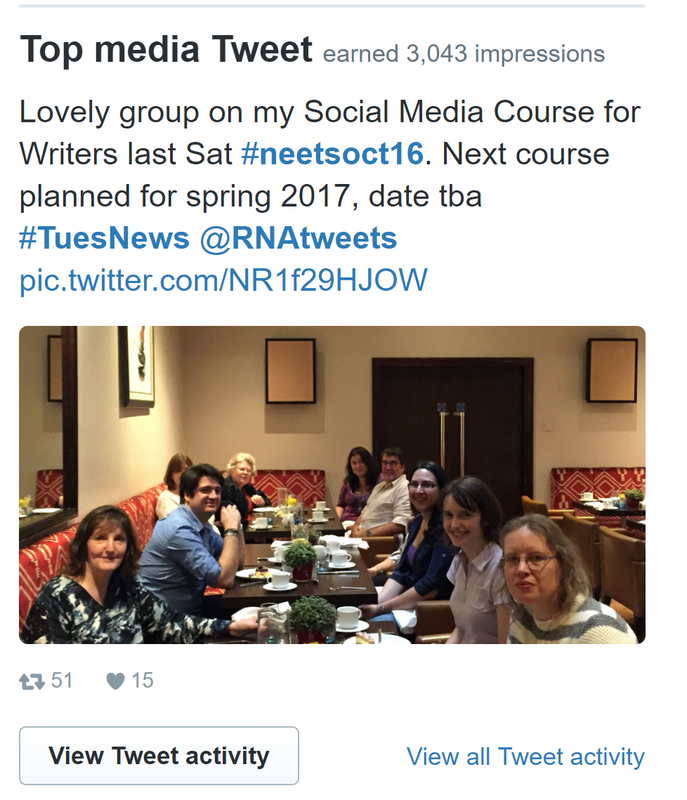 If you attend a writing event, use the (right) hashtag to find other attendees or to report from the event. Eg London Book Fair #lbf17. 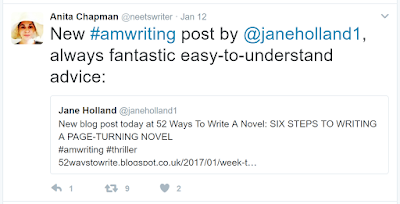 Find readers through common interests by looking up hashtags for subjects you’re interested in, and find hashtags which are related to your book(s). If your book is set in Cornwall, find readers through #Poldark, for example (see Liz Fenwick's guest post for more on this). Make the most of blog sharing hashtags such as #MondayBlogs and #wwwblogs to promote blog posts (not book promo though). Bear in mind that you should only take part in these hashtags if you’re going to reciprocate by retweeting other tweets which include the hashtag. Twitter chat hashtags: there are a lot of these such as #askagent, and they can be fun to join in with, plus they’re a way to grow your network. Added 11 July 2017: See my new post on hashtags, What are Hashtags, Why Use Them, and How? for more info (also linked to at the end of this post). How do you compose a tweet? Make sure links work (they currently take up some of the character limit). 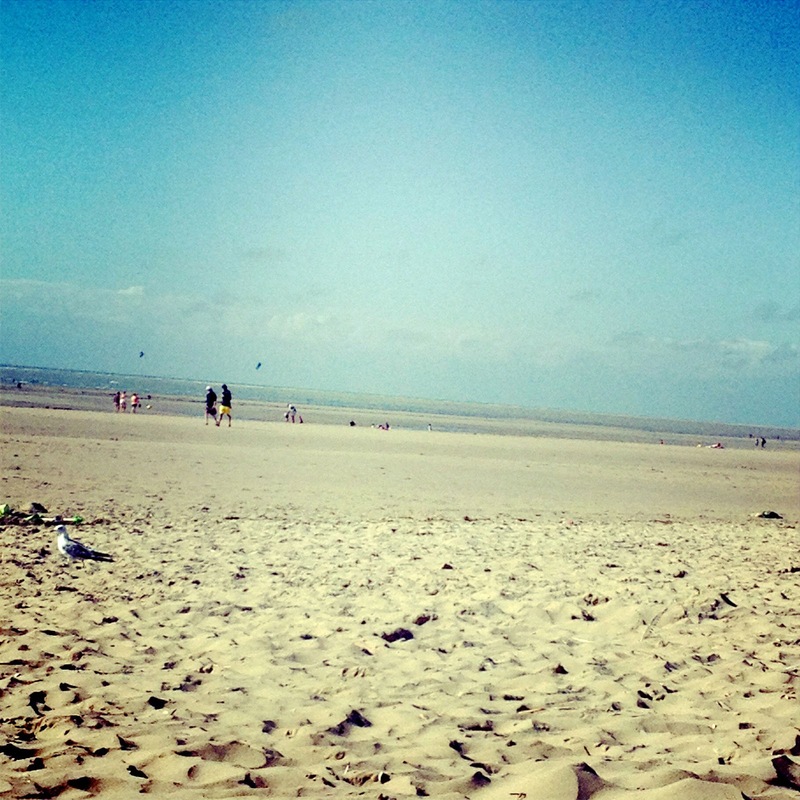 Use relevant hashtags to expand your reach (ideally no more than two, three max). Photos of your outings and baking, general observations about the frost on the lawn or a woodpecker on the bird-feeder. These tend to be some of my most popular tweets. Especially by those in your network or relating to your brand. And make the most of the Quote Tweet option when retweeting, by adding your comment when you have something to say. Share content from others like you, otherwise how can you expect anyone to share yours? If you write romantic fiction, you could tweet links to blog posts by other writers of this genre. If you write Georgian historical, you could tweet links to posts on Georgian stuff. 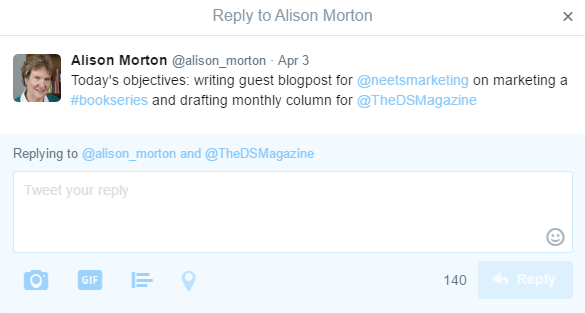 If you create your own tweets to share content, include the writer’s @username where possible rather than their name. This means they’ll definitely see you’ve shared their post (and they might RT it too). And if someone RTs your tweets, try to RT theirs, not necessarily immediately, but at some point. More on this in my post, 3 Ways to Retweet on Twitter. Interact to build relationships, and to make being on Twitter more interesting. Congratulate peers and idols on their writing achievements etc. I've made so many friends on Twitter, many of whom I've met 'in real life' at RNA, Historical Novel Society, Society of Women Writers and Journalists’ events, and other events such as at the London Book Fair, and book launches. Other pros of being on Twitter as a writer are learning more about the craft of writing and the publishing industry. Don’t thank someone for following you, if you’re not following back (such a cheek): They will probably then unfollow you. Don’t include ‘Please RT’ in any Tweet: It looks desperate and will probably have the opposite effect. Don’t mention @username someone with information about your book, blog etc, expecting them to RT this. For me, Direct Message is best used when you talk to someone online often and want to ask something like ‘Would you be interested in writing a guest post for my blog? If yes, DM your email address’ etc. Or if someone’s won a giveaway competition and you need to ask for their postal address. You can usually only DM someone if they’re following you, unless an account has enabled the option to receive DMs from anyone (more likely for a business). I prefer Facebook Messanger for these kinds of exchanges, although you need to be Facebook Friends with who you’re talking to, otherwise your message could be filtered and they might not see it. Some people do ignore Twitter DMs too, which is worth bearing in mind. Direct messages can also be sent to groups and you can find out more here. 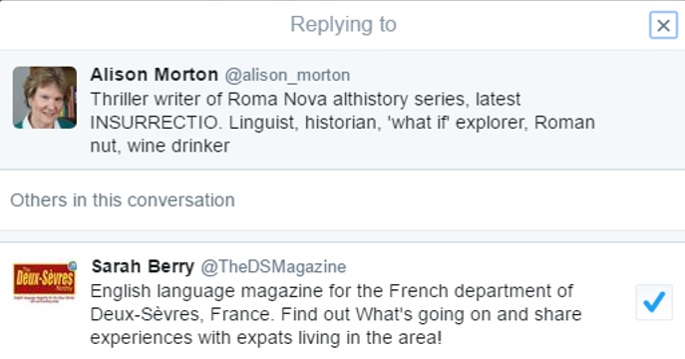 Don’t DM new followers with spam, asking them to like your Facebook Page, visit your website, buy your book etc. This can lose you followers, or get you reported for posting spam. And it’s annoying. Go into the @username profile, click on the wheel and the option to block or report will appear. If you know someone professionally/personally and they do a lot of promo and/or over-retweet, you can opt to mute them without causing offence. Read more here. Use Twitter analytics to see which are your most popular tweets, and more. 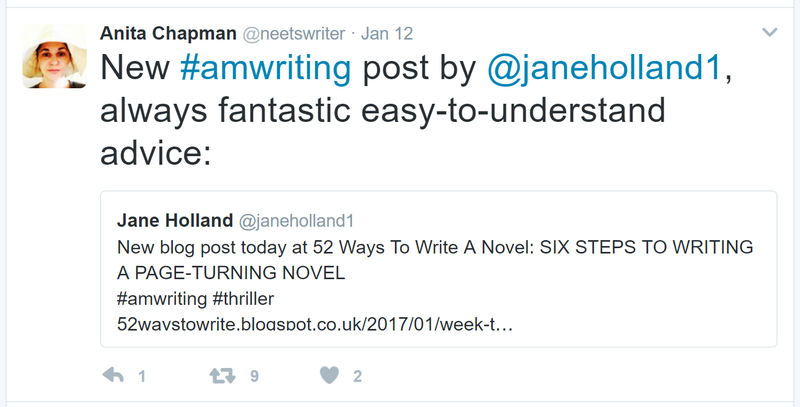 Why write a fabulous blog post, but not promote it on Twitter? (and Facebook). 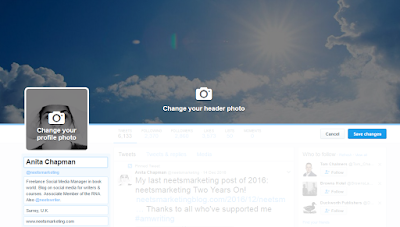 Why not have links to your Twitter @username (and Facebook Page) on your blog? Sometimes I see a great post that I’d like to share on Twitter, but I can’t tell if the writer of the post is on Twitter (usually they are), and sometimes I can’t find their name on their own blog. This is a missed opportunity to have your work shared. Put a Twitter Button, and if you can an embedded timeline on your blog and website. Subscribe to Twitter lists created by others in your network/relating to your brand as well, if those lists are useful to you. With scheduling, you can spread out professional tweets such as a link to a blog post, promo for a book etc and you can tweet in different time zones. If you publish a blog post, schedule it for a few days with different hashtags, images and wording. Same for cover reveal, pre-order, new release, paperback release etc. 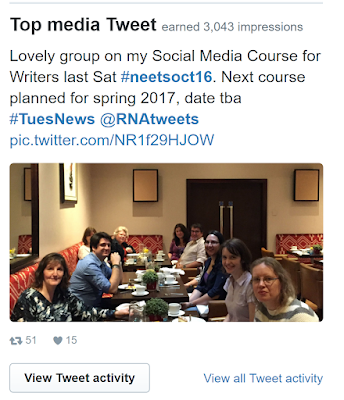 You can also schedule tweets promoting your talks, events, courses etc. Scheduling takes off the pressure, leaving you able to drop in when you have a spare moment to share content from others, and to tweet live. I add columns to Tweetdeck for my important Twitter lists, hashtags and searches. This is handy if you use more than one Twitter account and want to follow someone from all accounts at the same time, or retweet from more than one account (be careful when scheduling, liking, and replying to tweets if using more than one account, by ensuring you’ve clicked on the correct account). Set up columns in Tweetdeck/Hootsuite for hashtags, and relevant search words including your own name, book titles, links to your blog and website. 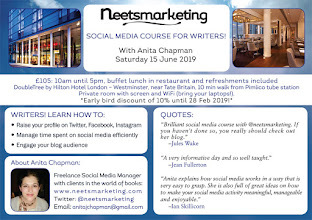 I’ve done a great deal of training over the phone/via Skype on Twitter and Tweetdeck (plus on Facebook), and I set up and trained a social media team for the Historical Novel Society before handing over to a new social media manager. Email me at anitajchapman at gmail dot com, to find out more. 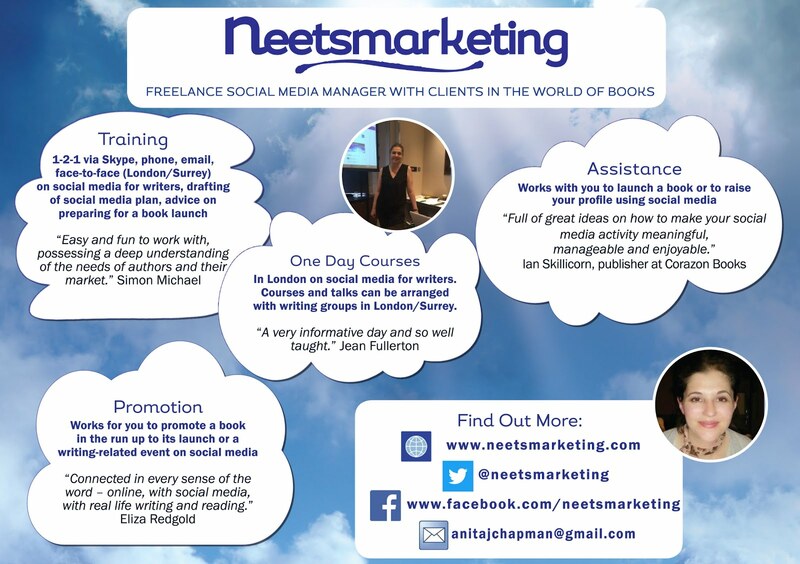 Information on what I do as a freelance social media manager with clients in the world of books via my website. 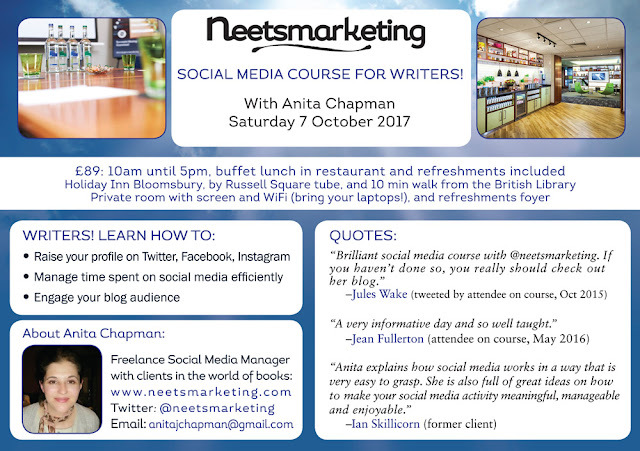 I also run Social Media Courses for Writers: 6 May 2017 (fully booked), and 7 October 2017, both at Holiday Inn Bloomsbury, London. To book, contact me via my website. And I thought I knew Twitter! Thank you for sharing, I had no idea things were changing. A good refresher, as well as a brilliant course for newbies on Twitter. Good to read your update, Anita - I'd noticed those couple of changes which is great for authors!